NTPRS – Top Take aways (4-5) Technology that is worth it! In a previous post I mentioned some of the most important things I learned at NTPRS in Chicago this summer. I mentioned TIME, PROPS, and PQA treasure hunts. 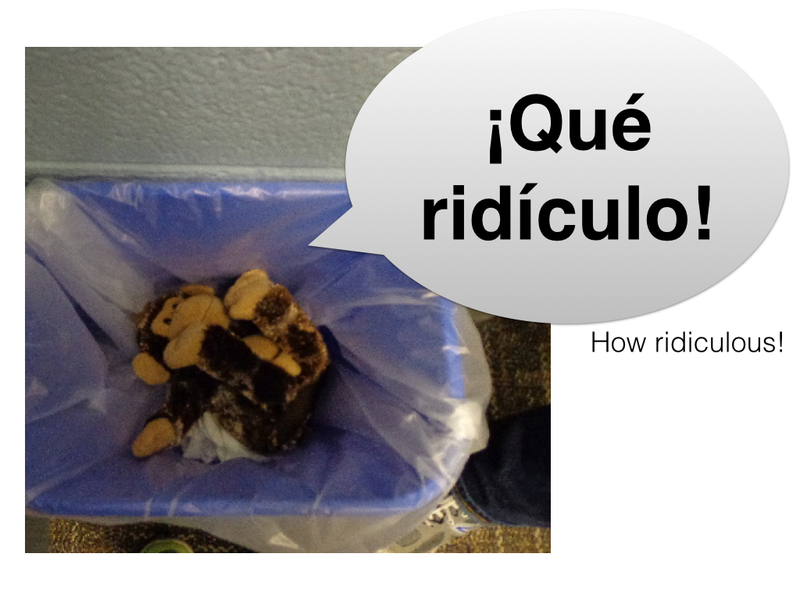 In this post I wanted to highlight some very simple technology tricks that I saw at NTPRS. I have made the mistake in the past of letting the process of creating a product overshadow demonstrating the content. I had grand plans for my students to use technology for a project, but spent twice the time teaching the technology and the content got left behind. I am all for teaching technology skills, but if the content isn’t there first then the technology becomes a distraction not a demonstration. At the end of the day if a pencil and some paper does the trick… then why bother? So I was excited to pick up some SIMPLE technology tricks that ACTUALLY enhance my student’s learning. Most of these come from the Elementary Workshop with Leslie Davison. It has been a simple addition to my storytelling that has had a HUGE impact. First, you have a student take pictures as you tell the story. That student is now engaged in the story in a whole different way because they are held accountant (by their peers) to have told the story in pictures. My students beg for this responsibility. Second, you have photos of that class story which is so powerful for retells, partner tells, writing and speaking activities, listening quizzes and review. The story you told in class now has a physical presence instead of just a memory in your student’s mind. My students know and come into class asking the next time I see them to see all the photos. They can’t wait to see themselves. So I retell the story on a powerpoint on the screen, and then they get their own copy to put in their folder. I even put some of the photos up in my room to remind us of the important vocabulary. Has it every been a distraction? Of course, what hasn’t been a distraction or a disruption in your classroom, (…talking to you pencil sharpener) but any good tool is worth taking the time to establish rules and expectations. It has breathed life into the stories for my students. Does anyone use pictures too, and have a cool activity to go with them?? My school has iPads. When we got the iPads, I was super pumped and excited. Then I started thinking about how to use them. What can my students DO with them? Well at NTPRS I got a very simple answer. Let the students video their stories. I really felt dumb for not thinking of this one. There is a camera feature that allows someone to film with very little setup. So far I have used them for three different assignments where students use the iPad camera. So… now with the iPads, I have my students take a comic strip or picture or some other prompt and send them off into nature to find a quiet spot to record. I give them 10-15 minutes to come back with a video. No pencil, no paper, no books.. nothing but the prompt and an iPad. I walk around and monitor my kids to make sure their technology is working and for accountability. 15 minutes later and I have completed my class speaking assignments. Can they look up words on an online/app dictionary?…yeah probably, but I am asking for a story so if they are looking up a word then they might be able to look up one or two but they still have to put it into context. To me, it wasn’t an issue worth worrying about. **An unexpected advantage was some of my students chose to walk around holding the iPad as they were telling the story. The physical activity helped them focus and let go of some of their nervous energy. 3. Vocabulary images- This activity uses the camera on the iPad to take pictures instead of video. Have students take pictures of different vocabulary. I am going to use this in a few weeks to have students take pictures using their location prepositions. Above, under, beside etc…Then throw the pictures into a presentations and/or print them out for a personalized vocabulary reference. What have you done with your iPads or other technology that was simple but effective?? Next ¿Te gusta la pizza? Great post, Anne! I love the idea of the kids taking the photos! What do they use to take the pictures? Every teacher at my school has a school provided camera that is really easy to use. Then I can insert the memory card from the camera into my computer for easy transfer. I have let my older kids use my phone before also. Some teachers have been allowing their students to use their own phones in class so they could do that. If you have access to iPads that would work too. I have used the apps tellagami and puppet pals to record students retelling a story. Lots of fun however at first students spent much longer than I expected photographing props & characters (themselves) but the results were well worth it. To get it right, they recorded and rerecorded many times to get it to the point where all actors were satisfied with the final product. I also love the photo idea and am definitely going to try that next term. I downloaded puppet pals a long time ago, but I was concerned about it taking too much time. But I wonder if it would make a good end of unit test or a throw away week when you are trying to get them to focus on crazy hat day.I have never tried tellagami. I will have to check it out. Thanks! Thank you ! These ideas are really helpful and I ‘m looking forward to trying the photo idea out. That is awesome that you are assigned a camera – not in our school, but I think I can check one out from our library.